The prospect of completing the final stages of the Tour du Mont Blanc will come as a bittersweet moment for many. On one hand, the idea that the fantastical experience enjoyed thus far is coming to an end is disheartening; on the other, the designers of the TMB truly saved the best for last. It is in Stage 9 that you will be crossing from Switzerland back into the French Vallee de l’Arve over Col de la Balme, the last col of the TMB. There will be an unending assault of incredible scenery through all three stages, so be sure to keep the camera handy and your eyes to the horizon. Where it begins, so shall it end. Entering the Vallee de l’Arve brings the most iconic mountain resort city, Chamonix, back into full view. Host of the first Winter Olympics in 1924, Chamonix has absolutely exploded with the popularity of skiing and other mountain activities. From the downtown leaves the highest vertical cable-car in the world, extending from Chamonix at 975 meters to the top of Aiguille du Midi at 3,840-meters. Just next door is another incredible cable-car ride to the top of Le Brevent at 2,530 meters with incredible views of Mont Blanc right across the valley. Chamonix is a sister-city to many, including Courmayeur on the Italian-side of Mont Blanc to which it is connected by a two lane highway in a tunnel over 11 kilometers long that runs under Mont Blanc itself. Incredible engineering has turned this quiet agricultural town into one of the grandest mountain resorts in the world. Being back near Chamonix, the options for lodging are incredibly diverse depending on how closely you wish to follow the standard TMB route. At the end of Stage 9, the most convenient towns for lodging will be at the base of the descent from Col de Balme in either Le Tour, Montroc, or Tre le Champ, where plentiful options are available for every budget. The way you wish to tackle Stages 10 and 11 bring many possibilities. The standard stop at the end of Stage 10 is La Flegere, but it is recommended to stay the night at Refuge Lac Blanc if it is available because it has one of the finest sunrise views in the world, not to mention the Alps. Refuge Bellachat along the descent from Brevent gives another mountain hut option during Stage 11. In addition to the mountain huts there are Telepherique options to ride down into the valley at Flegere and another two stage cable-car at Plan Praz, halfway between Chamonix and the summit of Brevent. At that point any hotel in the Chamonix Valley could be used for lodging at the end of Stage 10 or 11 upon completing the TMB. 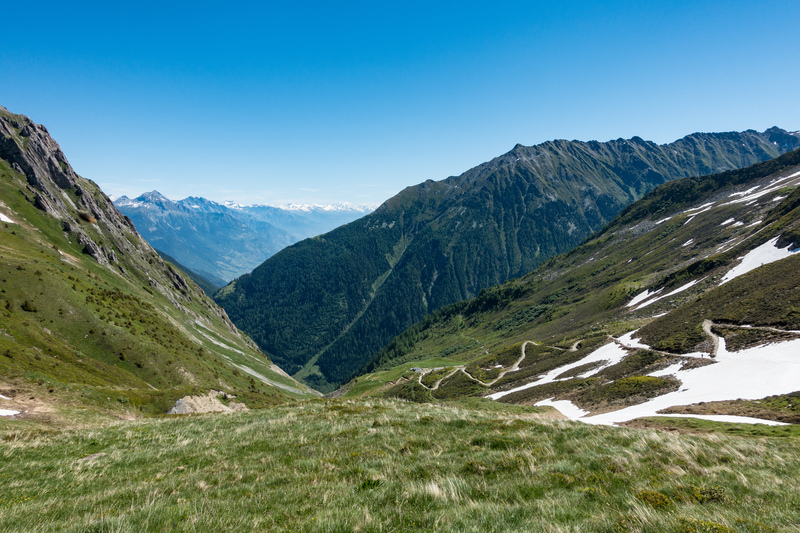 Among variants for these stages there are a few different options, but the most meaningful difference is with Stage 9 because the hike to Refuge Les Grands before Col de Balme is a very different experience. Longer and more strenuous, it is recommended to stay at Refuge Les Grands at the end of Stage 8 to shorten the journey if this is in your plans. From Col de Balme, the primary route is over Aiguillette des Possettes, a very scenic ridge walk with sweeping panoramic views. The variant differences with Stage 10 are less pronounced. The famous “Ladders” section can be taken from Tre le Champ, which uses metal rungs and ladders bolted into the mountain to traverse the rocky outcroppings while climbing toward Lac Blanc; alternately, the other option is a steep climb further north that is followed by a very mellow and less crowded balcony trail that is an equally scenic option. 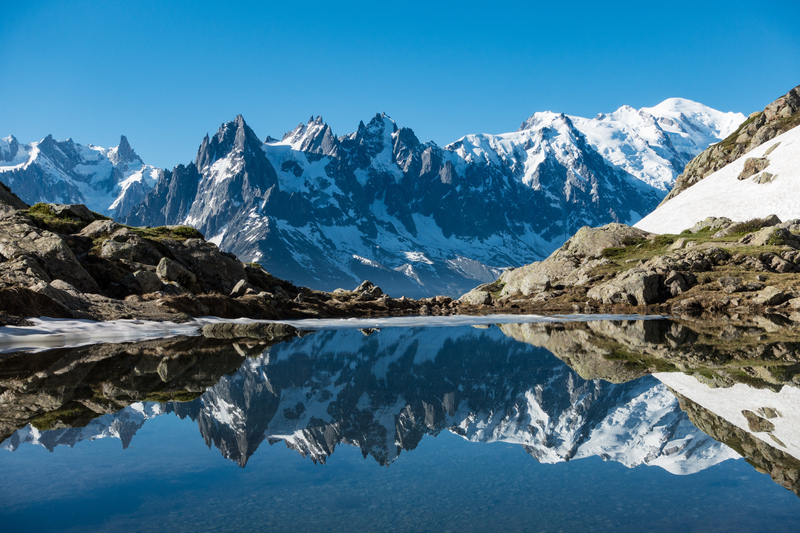 Whether you'll be staying at Lac Blanc or La Flegere, Stage 11 follows the Grand Balcony trail above Chamonix as you make your way toward Le Brevent. There is no variant here except to possibly cut the trek short from the summit of Brevent or Plan Praz. The long and arduous descent from Le Brevent down to Les Houches can seem pointless after the incredible panoramas and experiences of Stage 11 to this point...it is over 1,500 meters of descent through the forest without any views that are dramatically different than those seen high on Brevent. Nearing the Col de Balme and looking to the trail behind. Whether staying in Trient, Peuty, or Col de la Forclaz, the day for those doing the standard Stage 9 will begin by making their way to the bottom of the Col de Balme, the climb to which will encompass the first half of Stage 9. After walking the road and crossing a small meadow, the beginning of the climb is signified by a small stream crossing and an entrance into the trees. A seemingly endless supply of switchbacks will eventually lead you out of the trees and onto a balcony trail with a wonderful view of the Trient Valley and all the way to the much lower Col de la Forclaz. The balcony trail undulates along the hillside until arriving just below the Col de Balme, where some buildings mark the start of another smaller set of switchbacks to get up to the col itself. In clear weather this col crossing will be one of the more memorable because the ice giants of Mont Blanc and Aiguille Verte dwarf the surrounding peaks in view. This is where the alternate Stage 9 meets up with the standard route, having just completed the rolling trail from Refuge les Grands with views of the mountains surrounding Trient. If the weather is deteriorating, someone has an injury, or the trek thus far has been too much, there is a Telephonique to the left of the col just on the other side, and several paths to take you down to Le Tour and out of the high country more directly. In all other cases, it is recommended to follow the standard route toward Aiguillette des Posettes for a continued and unending array of panoramic glory along the ridgewalk descent toward Tre-le-Champ. While descending, make sure to pay attention to the hillside just opposite and in front of you, where you can get a good look at the two options for Stage 10: the more gradual and famous ladders section to the left, or the steeper but potentially more scenic steep climb on the right with the dozens of visible switchbacks. The ridge walking at Aiguillete des Posettes and the descent thereafter is the best place to view wildflowers on this stage. Alpenrose and white cottongrass are especially prominent here, along with lupine in the fields at the bottom near Tre les Champ. These will be in bloom from early June to late July. Once you arrive at the bottom, an array of lodging options are available from hotel to hostel. Reflection in alpine lake opposite Mont Blanc. There are two variations as part of Stage 10. The first is deciding whether to do the ladders or to take the Grand Balcon Sud variant. The next is to decide whether to deviate toward Lac Blanc or maintain a straight line toward La Flegere. If you'll be taking the ladders, it is a fairly straightforward though exceedingly adventurous option that leaves from Tre le Champ and meets the alternate path from Col des Montets just before you have to decide whether to head to Lac Blanc or go straight to La Flegere. The ladders are not recommended for someone with a fear of heights: Though risk of injury is minimal, it is not a comfortable experience for those without a head for heights. The alternate option along the upper balcony path above the ladders leaves just up the road from Tre le Champ and has higher and wider views. And, because it is less frequently traveled, there is a high likelihood of viewing ibex in their natural habitat. Whether you'll be staying at Lac Blanc or La Flegere, a side-trip to Lac Blanc is never a regretful use of time if you can afford it. You are forever in the heart of a postcard during the entire hike up and hike down from Lac Blanc, and the path rejoins later, so no doubling back is necessary. If you are staying at Lac Blanc, neglecting to enjoy the first rays of sun over the horizon the following morning would be a travesty. The food here is also excellent, though the sleeping quarters can find some wanting for more privacy. If you'll be continuing onward to the official end for Stage 10 at La Flegere, continue down from Lac Blanc (or stay on the standard path) along the Grand Balcon Sud Trail with uninterrupted views of the Mer du Glace Glacier tumbling down from the back of the Grand Jorrasses, Mont Blanc itself, Aiguille Verte, and Aiguille du Midi with all of the jagged peaks in-between them. La Flegere also has a cable car option down to the city in case you were not able to secure lodging at either Lac Blanc or La Flegere. 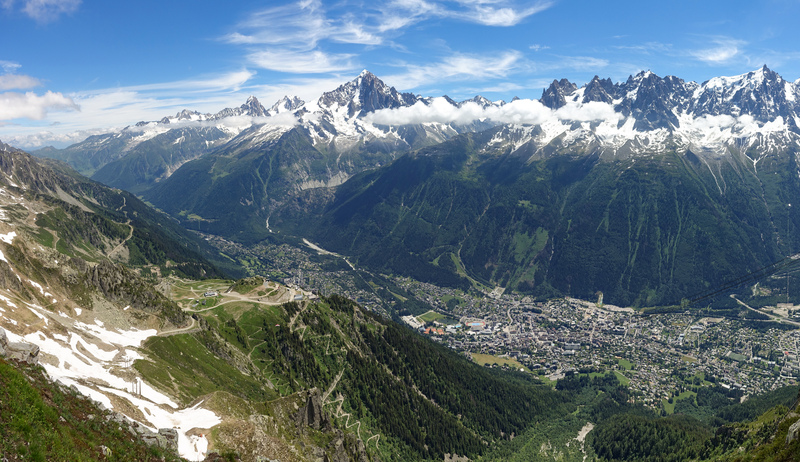 Panoramic views of Chamonix from Le Brevent. Sunrise from Lac Blanc or La Flegere will forever establish a high threshold for alpine views that will be tough to surpass. Enjoy a hearty breakfast feasting on the views of what is sadly the last stage of the TMB. If it helps you pry yourself away from this perfect vantage point from which to watch the light unfold on the mountains, remember that the Grand Balcony Trail awaits you. The balcony path from La Flegere to Plan Praz is a definite highlight of the entire tour, and it provides uninterrupted and spectacular views of the core of the Mont Blanc massif. The Grand Balcony will take you through several small wooded areas and across a couple of boulder fields that have been leveled out for easy walking. Once you reach Plan Praz, the climb to Le Brevent will begin. This climb will feel different; it is more like climbing a mountain rather than summiting a col summiting. Another world opens up after you reach Col du Brevent; gone are the views of Mont Blanc that you have been staring at all day, and revealed is the expanse of the mountains that have been right behind you for the past two days. These include Pointe de Plate, Pointe d’Anterne, Tete a l‘Ane, and many more. After circling Le Brevent along steep snow slopes and over several ladders, the final boulderfield will take you to the summit, where a developed viewing platform and refreshments are available. This is a culminating event of the Tour du Mont Blanc, and from here you can see the entire Mont Blanc Range all the way north to Col de Balme along with Les Houches and Col de Voza, where your journey began 10 days prior. With a celebratory beer or cappuccino, many trekkers choose to take the tram down to Chamonix rather than suffer the 1,500-meter descent to Les Houches. Much of the rest of Stage 11 is forested and devoid of any views not already enjoyed from the summit. Whether hiking down or taking the cable car, you have now completed one of the most incredible treks in the world, and all that remains is to begin planning your next adventure.